We all enjoyed playing hide and seek as kids. 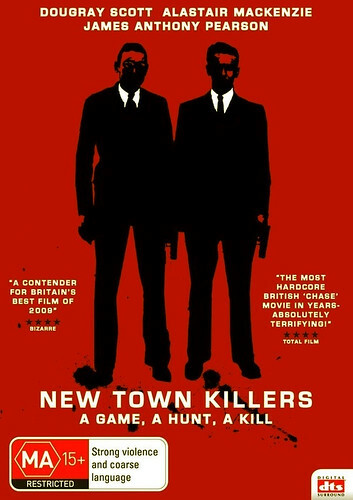 And well, New Town Killers is based on exactly that. Sean (James Anthony Pearson) and Sam (Charles Mnene) are two British kids roaming around the streets. Sean’s sister Alice (Liz White) owes 12,000 pounds because of something she did (the film doesn’t delve into details). One day Sean meets Alistair (Dougray Scott, the bad guy from MI-2) and Jamie (Alastair Macinzie), two investment bankers, and is offered a 1000 pounds if he hides from them all night. They also hand Sean a key to a locker in the subway station which contains another 11 grant. The locker has to be opened by 9am the next day. If he manages to do all of this then he can keep the money. Else he has to give them back the 1000 pounds. Sean decides to play along and the film is about them chasing each other. I just found the film utterly boring. It tries too hard to capture the attention of the viewers by introducing some stunts in between. But in the end the movie is just about hide and seek with high stakes. The film looked promising in the beginning but in the end I just found the plot to be silly and faulty. The only thing I enjoyed was the film’s soundtracks. My favorite line: I honestly did not have any!